Does Nicaragua match up to its Global Gender Gap Report ranking on women’s rights? Nicaragua has been ranked as one of the most gender-equal countries in the world, but the reality on the ground is that Nicaraguan women don’t have it all that easy. Nicaragua is one of the countries with the smallest gender gap in the world, behind only the five Scandinavian countries, according to the latest edition of a report studying gender inequality. It is comfortably the best performing Latin American country in the index, although six other countries from the region make the global top 50. The Global Gender Gap Report 2014, carried out by the World Economic Forum (WEF), places Nicaragua 6th on the list of countries with the closest gap between male and female levels of economic, political, health and educational participation and opportunity. The study covers 142 countries in total, including all Latin American countries, with the exception of Haiti. Ecuador is ranked 21st, with Cuba 30th, Argentina 31st, Peru 45th, Panama 46th, and Costa Rica 48th. The worst performing Latin American countries are Belize (100th), Guatemala (89th), and Venezuela (86th). The region’s two major economies and largest countries, Brazil and Mexico, come 71st and 80th on the list, respectively. The report remarks that Nicaragua has now spent three consecutive years in the global top 10, having closed 79% of the gender gap – meaning that its average score for female participation and opportunity across all indicators is 79% that of the corresponding male figure. It is one of the countries that has improved most since the report’s first edition in 2006, although it still lags behind in 95th position globally on economic participation and opportunity. Overall, the Latin America and Caribbean region is reported to have closed 70% of its gender gap, behind the North America and Europe & Central Asia regions. Furthermore, it is the region that has seen most overall improvement since 2006, with every country in the region seen as having narrowed their overall gender gaps in this time. Meanwhile, Guatemala holds the distinction of being the most improved country on the overall index since last year. The region fares particularly well on the health and survival indicator, ranked the best region in the world with 12 countries judged to have closed the gap more or less completely, and thus ranked joint 1st overall. It is also generally strong on educational attainment, having closed more than 99% of the gap. However, on economic participation and opportunity, the region remains rather weak, with Ecuador the least worst performer at 45th place overall, and Chile and Mexico receiving particularly low ratings at 119th and 120th on the global rankings. However, out of all the world’s regions, Latin America has made the most progress in this area since 2006, closing the gap by around 7%. There is also plenty of space for improvement in political empowerment, although the report notes that this area remains a weak spot across most of the rest of the world. Nicaragua (4th), Cuba (18th), and Argentina (21st) are the brightest spots from the region in this criterion, but even so Argentina only scores 0.32 (out of a possible 1; top-ranked Iceland scores 0.65), and the regional average is just 0.2 (meaning 20% of the gender gap closed). Michelle Bachelet, President of Chile from 2006-2010 and reelected for a second term last year, was also the first director of the UN Women agency. Her reelection could be seen as proof that political representation in Latin America is slowly improving, although on this and other factors there is still a long way to go. Photo courtesy of AP via Huffington Post. 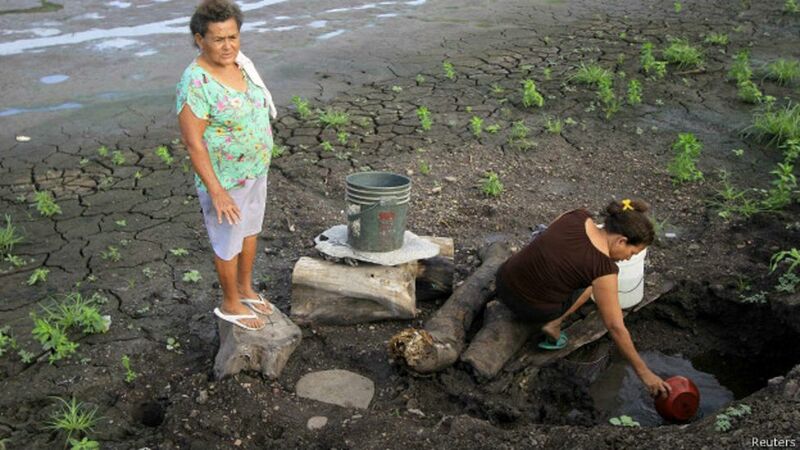 Nicaragua: does the Global Gender Gap Report really tell the whole story? Inevitably, much of the attention on Latin America concerning the Global Gender Gap Report 2014 has focused on Nicaragua, and its remarkable status as the highest-ranked country outside of Scandinavia, despite it being one of the poorest countries in Latin America, with the lowest Human Development Index rating in the region. Seemingly, a major reason why it has fared so well in this and the last few editions of the report is that it scores particularly well on gender equality in the political sphere, by far the most unequal area on a global scale. Nicaragua is ranked 4th with a score of 0.544, whereas the global average is just 0.214. It is the number one-ranked country for women in ministerial positions, with the rare accomplishment of having a majority of these posts held by women. It is also ranked joint 1st for several other criteria, such as enrolment in all three stages of education, healthy life expectancy, and female participation among professional and technical workers. However, female labour force participation is just 49% (compared to 82% among men), while women can expect to earn just 46% as much as men do. On top of all this, there has been some scepticism over whether Nicaragua really is such a good country in which to be a woman. An article by BBC Mundo (link in Spanish) reports a certain degree of surprise among observers, who claim that the picture isn’t really all that rosy for Nicaraguan women. Part of the reason for this confusion is that the report compares the situation of women compared to men in a particular country. Were the report somehow able to compare the situation of women in one country compared to those in the rest of the world, the overall analysis would no doubt provide some very different conclusions. As Saadia Zahidi, director of the WEF’s Gender Parity programme, explained to BBC Mundo: “what we measure is the gap between men and women, rather than the resources and opportunities available to women”. One example that is given to highlight this difference is that, while Nicaragua is one of 99 countries where women are equally or more likely than men to enrol in university, the fact remains that just 19% of Nicaraguan women are able to do this – compared to just 17% of men. This means that while the country’s educational attainment score is propped up by a maximum score on this front, boosting its overall ranking, it risks obscuring the reality that for the vast majority of Nicaraguan women, university education remains somewhat out of reach. Whatever the Global Gender Gap Report might say, economic opportunities for Nicaraguan women are all too often far from adequate. Photo courtesy of Reuters via the BBC. Another far more pertinent example of a social reality that the WEF’s figures fail to accurately portray, is the situation surrounding abortion law. Nicaragua may be judged by the study to have achieved near-total parity on health and survival, yet it is also one of just six countries in the whole world where abortion is illegal under all circumstances. Three of the others, incidentally, are also Latin American: Chile, El Salvador, and the Dominican Republic, while the Vatican and Malta complete the list. This clearly represents a hugely regressive element of women’s rights, meaning that despite Nicaragua’s high position in the report’s overall rankings, it remains one of the worst countries in the world when it comes to women’s control over their own bodies. Even countries from the North Africa and Middle East region, which apart from Israel are all ranked below 100th in the WEF report, have some form of stipulation where abortion might be permissible under certain circumstances. On top of this, local feminist organisations even claim that Nicaragua’s apparent strength in female political representation is misleading. According to the BBC Mundo report, feminist groups insist that most female politicians are more loyal to the dominant Sandinista party – led by President Daniel Ortega – than to women’s causes. There has been controversy recently over new laws that appear to reduce the legal severity of crimes such as femicide and gender violence, suggesting that the government is far less committed to making women’s rights a social reality as might otherwise be assumed. In practice, it seems, the situation in Nicaragua all boils down to this observation made by BBC Mundo: “All things considered, it appears clear that what the report is saying is that in Nicaragua, [the situation of] women is, at least, not much worse than [that of] men”. That’s not to take away from the ways in which Nicaragua can justifiably claim to be performing well on gender equality issues – extensively-researched and comprehensive figures such as those of the WEF report can’t be that far off the mark, after all. But one should not allow Nicaragua’s impressive showing on those criteria covered by the report to cover up its deficiencies elsewhere. 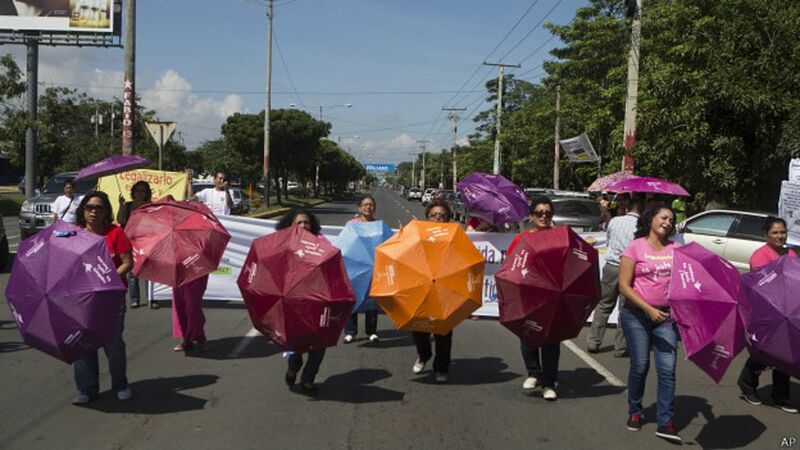 Women take part in a pro-abortion march in Nicaragua earlier this year. The country is one of just six around the world (four of which are in Latin America) where abortion is banned in all cases. Photo courtesy of AP via the BBC. Was wondering why there was such a disparity between the UNDP Gender Inequality Score and the Global Gender Gap Report score.